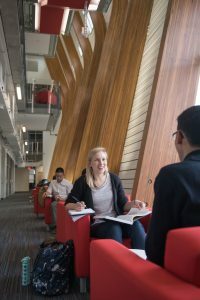 Peer Assisted Study Sessions (PASS) are anonymous, free, structured group study sessions designed to help students understand key concepts and practice the skills necessary for success in traditionally challenging courses. PASS sessions compliment what you learn while attending lectures, meeting with your TA and attending office hours, and but are not a replacement. Our learning environments are welcoming, supportive and fun and we focus on helping you gain a deeper understanding of the course material and improving your study skills without concerns about being graded. Which classes does PASS support? Why should I come to PASS? PASS focuses on utilizing active learning techniques, which means you will be engaging with the course materials in a variety of different ways that promotes collaboration with your peers. Research has shown that the more PASS sessions students attend, the greater likelihood they are of improving their overall understanding of key concepts, which results in achieving higher grades. Come and join our fun and dynamic learning community, spend time with other Kinners and work together to build your academic base in Anatomy and Physiology.